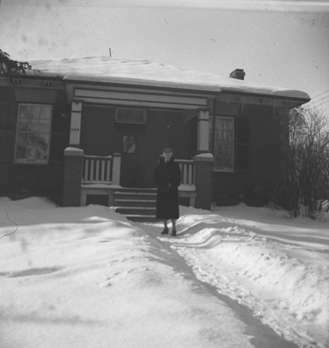 Miss Ruth Gertrude Bryan wearing a 3/4 length coat and standing in front of a house in winter. Ruth Gertrude Bryan (1872-1961) was the superintendent of the Ontario Hospital School of Nursing at Whitby, Ontario from 1921-1932. Then she was transferred to the hospital at Cobourg, Ontario. The house in this picture was Miss Bryan's home at the time. It remains standing in its original location at 206 Byron Street North, Whitby, Ontario. Gertrude Bryan at 206 Byron St. N., 1945, Marjorie Ruddy. Whitby Archives A2013_040_1227.